"Wild and adventurous - thousands of spirals falling apart shattering crisply like glass on concrete constantly rebuilding themselves. Reminiscences of jungle music, overwhelming and mesmerizing. Extrinsic at first becomming confident more and more. Fieldrecordings, communication between sounds of future cities in dependence on the tradition of contemporary music and musique concrete..."
R is a fulminate debut. The creation of the album took three years and illustrates the artistic development of the young composerduo. Every track is based on a unique theme like a phenomenon, a musical shape. Be it a self imposed restriction to certain sound materials, be it a technical process or a special working method, they all express dis.playce´s genuine concern for atmosphere and feeling. dis.playce started working in 2002 mainly with sound material from an old analog synthesizer, which was then processed digitally. Two pieces are almost completely made of concrete sounds. The latest tracks are based on the experience of live concerts, the communication between sounds, room and audience. They are completely digital made using custom software. R is diversified, versatile, playful and very fragile even though it has a well balanced compositional strength. Jeder Track hat ein Thema: ein Phänomen, eine Gestalt, um die es geht. Dieses Thema kann rein musikalisch sein, eine Beschränkung auf eine bestimmte Klasse von Klangquellen, ein technisches Verfahren oder etwas außermusikalisches. Die ersten im Jahre 2002 entstandenen Stücke arbeiten hauptsächlich mit Material aus Improvisationen mit einem analogen Synthesizer, welches dann zur Grundlage für digitales Processing wurde. Zwei Stücke sind beinahe ausschließlich aus konkreten Klängen komponiert. Die jüngsten Stücke bauen auf der Erfahrung von Liveauftritten, der Kommunikation mit Raum und Publikum auf. Sie wurden mit Hilfe von selbstgeschriebener Software komplett am Computer komponiert und produziert. R ist abwechslungsreich und vielfältig, behält sich aber trotz seiner, für moderne Komponisten, überraschenden Verspieltheit eine gewisse Strenge und Geschlossenheit. The cover design of shattered typography that spreads like shards of broken glass or chunks of shrapnel perfectly describes the musical contents within - an ingenious collage of glitch, ambience and noise. Seamlessly assembled by Maximilian Marcoll and Hannes Seidl, R´s nine sections switch from full force electro boost to dripping tap, laptop sound sculpting in mere seconds. Emotions are tossed like salad, while sounds are explored and blended into a heady cocktail of mixed moods and itchy atmospherics. The release department of a Bremen/Berlin based artist collective engaged in audiovisuals and dedicated to making films, producing sound collages and composing experimental music, put this specimen of their post avant-garde adventures’ current direction into my mailbox. Already the eye catching cover by the naivsuper design team shows that the eyes are invited to listen too. 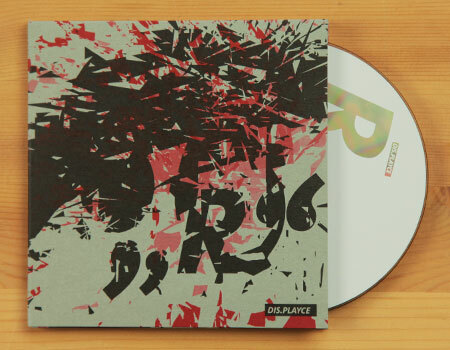 Dis.playce is a duo consisting of Maximilian Marcoll (*1981), drummer and former head of the Ensemble für zeitgenössische Musik (Ensemble for contemporary music), Lübeck, and Galette Seidl (*1977 in Bremen). They founded in 2002 when both of them were studying composition at the Folkwang-Hochschule (Folkwang college), Essen. In the meantime being regarded with multiple stipends and awards Seidl continued his studies at the IEM Graz and is currently working with the Ensemble Modern. Being an electro-duo they work with analogue synthesizers and digital processing, or with laptops and the gaming environment COOPER as well as pieces of electronic construction units. With this equipment and the help of self rolled softzware they generate a series of controlled sound ex- and implosions out of samples and field recordings. Each of the 8 tracks is characterized by a carefully chosen construction process or a concrete emphasis on material. As in the microphone R5 plastic foils and beer cans are being exploited as sources. In R6 water and body sounds serve as sonic foil. In R7 insects play the main part and in the somewhat immersed R8 some additional pulverized orchestra samples. The sequence R1 – R8 is reflecting the progress in material and the growing ability to handle complex noise art. The abstract and the concrete converge energetically straight from the beginning when dis.playce are turning sonic space with ardour into a four dimensional Pollock-like dribbling, when they expose sound molecules to electron fire and provoke harsh collisions.